DCI.org had the opportunity to visit The Cadets' rehearsal facility last Friday in the booming metropolis of Farmer City, Ill. A stone throw away from the DCI Central Illinois show in Normal, Ill., The Cadets were hard at work preparing for that night's performance. Able to catch the corps between rehearsal blocks during a lunch break, we had the opportunity to meet with many of the corps members that are bringing The Cadets' 2004 Jethro Tull-inspired production, "Living in the Past," to life. The Cadets' guard line gives Robert Plant a run for his money. View a Cadets' photo gallery, featuring pictures by Katie Ford. Songs from the Wood -- Love from the English Ellen Gibson, a guard member, comes to The Cadets from England from the stomping grounds of the original Jethro Tull ensemble. "I marched Crossmen last year and finally made it this year with The Cadets," she said. "I've been in the states off and on throughout the year. Basically since May of last year I've been here doing color guard, WGI and DCI." Gibson, like many of the current Cadets members, had her doubts about marching a Jethro Tull show when the concept was announced during the winter. "When I first found out about the show concept, I thought 'ugh, how's that going to look as a drum corps show?' but then I kind of got excited because it was English," Gibson said. "A lot of people back home are really excited that the Cadets are doing an English show." "Honestly, when they first told us we were doing Jethro Tull I was really skeptical and I think a lot of people were," said Michael McKenna of the drum line. "We started listening to some of his music and couldn't think how you could possibly get this type of stuff into drum corps." Soon after delving into the realm of Jethro Tull, listening to the music and starting rehearsals, the members quickly changed to accept and appreciate the type of production being put together by the corps' design team. "When I finally heard the music selected, I said, 'Wow this sounds pretty good, the arrangement is fantastic, the way they made it into a drum corps show works really well'," said Gibson. McKenna also quickly became a believer. "I do think the design team did an amazing job with the show this year. They found some of the best songs that Tull has and found a way to put it on the field and 'drumcorpsize' it, so to say," he said One of the selling points of the show for McKenna has been the different drumming styles written in the arrangement. "In the second tune we play more classically and controlled and then we have drum solos all throughout where you just let go with complete energy," he said. "Jethro Tull music combines so many different styles, from classical to jazz, and we get to play a little bit of all of those in this show." Aqualung -- Need it for the rainy days? The trials and tribulations of the pit section Not many sections have a tougher job than the pit. Having to schlep equipment to and from rehearsal sites and loading and unloading the truck at moment's notice are just a few of the hardships encountered by the section. "It has been raining a lot this year and recently it has been catching up to us," said Sarah Keeton, pit member. "A few days ago we were in Michigan. It had been raining steadily for a couple hours and when we were done with rehearsal the Daihatsu (equipment tractor) broke down when we were about to load it. After that, we were forced to push everything up a muddy hill where the broken Daihatsu decided to get stuck in the mud." "That day was miserable," said Amol Rana, pit member. "It was 50 degrees that day, we got rained on for three and a half hours and then had to load the truck and pull everything out later all soggy and moldy. Getting through that day was pretty tough, also because we had a show, and after all was said and done we only had something like 20 minutes to get ready." Despite the setback for the show that day and for any day, the pit works their frustrations out on the way to the show with their traditional drum bus hype CD. "Almost always the first song we listen to is Outkast's 'Bombs over Baghdad.' That in addition to a plethora of other rap tunes pumps us up for the show," said Rana. When asked if listening to that style of music before a show hinders preparing to play a completely different style of music during the show, Rana attested that the group is well-prepared and could be ready for just about anything. "We are so robotic when it comes to playing our music that we could probably listen to bluegrass music right before we got on the field and still rock out during the performance," he said. Living in the past -- living with the guard: From bustier to baton twirler Ask any of The Cadets guard members this season what one of the highlights of the guard show is and they'll answer, the uniforms. The guard uniforms this year are a throwback to the days of the hard-rockin' past, when bands like Led Zeppelin and the Stones reigned supreme. Look for the guard this season sporting denim pants tighter than even Zeppelin lead singer Robert Plant would dare to wear, and shirts with ruffles a la Jimi Hendrix in the late '60s. "Not to sound bigheaded, but when I put the uniform on I look hot. The uniforms are fantastic," said Ellen Gibson. "When we get off the bus at a show site, more than just the uniforms make people watch us. They're looking at us because we're The Cadets and that is flattering and exciting. It really psyches you up." "The uniforms are the deal! 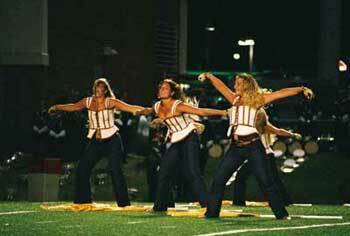 The girls wear bustiers under the first top which makes everyone look so good," said Eric Babula, guard member. "The best part in the guard show is when the girls take off their shirts and then they take off our shirts for us and the second uniform is revealed." Inquiring minds wanted to know, so we asked, "Is that real denim you wear out there?" "It's like denim, but not quite. It's a stretchy lycra. The pants aren't hard to do work in, even though they are hard to put on. They are form-fitting so you can move in them once you get them on," said Babula. Guard uniforms aside, two of the most controversial words from critics of the Cadets' show this summer have been "baton twirler," and usually stated with a few extra punctuation marks to read, "baton twirler!?!?!?!?" Sean Wimberley, a first-year guard member is the man behind the baton. "When I originally started here I had no idea was going to spin baton. I went to the first camp and they asked me where my batons were," said Wimberley. "I told them I didn't bring them because I came here to do color guard work, but they told I would be twirling in the show." Wimberley is a force to be reckoned with when it comes to twirling. An 11-year master of the twirling arts, he is proud of his accomplishments. "I've won world twice, 1996 in Milan, Italy, and 2000 in Birmingham, England. And I've won nationals eight times." Look for Wimberly's baton twirling in three different sections of the production. Thick as a brick -- building outside of a typical drum corps experience As corps director, George Hopkins strives to work with his members to look at the summer as more than just marching with a drum corps. He said that this year's members have an incredible grasp of that idea. "I hesitate to compare year to year and people to people, but this is a group of members that somehow are all united in their sense of trying to make something of themselves in the world," said Hopkins. Hopkins spends a couple of hours each week talking with the corps about general life experiences. He gives writing assignments to the corps members on anything from how they are feeling about the season to their future life goals. After collecting the writings, Hopkins reads through each one and returns with his own comments. "I think they really get this thing. They understand that drum corps isn't just to win a championship but actually about the lessons they learn and how they can transfer those into life," said Hopkins. "Anything we do here we try to relate to their life." One of Hopkins' most recent discussions was about why members go out and practice. He related the discussion to having to go out to rehearse in Texas where it is consistently over 100 degrees during the summer. "I know that they probably don't want to go out there in those conditions, but I ask them to figure out why they do go out in it," he said. "I think it's because they believe in what they're after and they know what they have to do. Those are the kinds of lessons that are going to translate to them when they're a parent and their kid is sick at four in the morning, if they're going to med school and they're up all night, or if they're just taking a course that they hate but are forced to push through it." Matt Haines, drum major, has come to understand in the past four years with the corps the life lessons he is learning. "If you take the 135 people, here it's probably pretty representative of what the world is like. So it's kind of like our own little world where we get to learn a lot about dealing with other people," he said. "You learn a lot of things you can take out into the real world after this experience." "I consider it a laboratory. You can come out here and be who you want to be for three months. Your parents aren't bugging you and your friends are leaving you alone, except for cell phones, and you can try to work on yourself for a little bit in between rehearsing for 12 hours a day," said Hopkins.